Meigs freshman Coulter Cleland (10) drives past Warren’s Kurt Taylor (00), during the Warriors’ 63-48 victory on Tuesday in Rocksprings, Ohio. Meigs senior Cole Betzing lines up a three-pointer, during the Marauders’ 63-48 setback on Tuesday in Rocksprings, Ohio. ROCKSPRINGS, Ohio — Not the home opener the Marauders were hoping for. 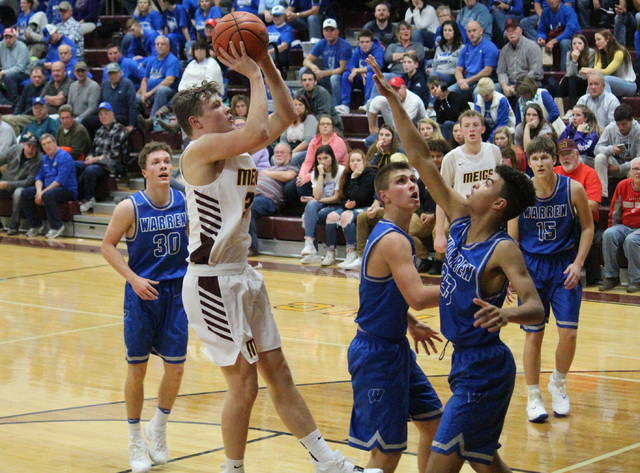 The Meigs boys basketball team never led and fell to non-conference guest Warren by a 63-48 final on Tuesday inside Larry R. Morrison Gymnasium. Warren (1-1) scored the first five points of the night, holding the Marauders (1-1) scoreless for the opening four minutes. The Warriors led 15-8 at the end of the first quarter, and then started the second with a 6-1 run. Meigs fought back with a 17-8 spurt over the final five minutes of the first half, cutting the Warrior advantage to 29-26 at halftime. MHS senior Nick Lilly hit a three-pointer 18 seconds into the second half, tying the game at 29, but Warren reestablished the lead with a two-pointer a minute later. Lilly then made a two-pointer to tie the game at 31, but the Warriors answered with a trifecta and never lost the advantage. Warren led by a 45-38 clip at the end of the third, but Meigs cut its deficit to five points in the opening 1:30 of the finale. However, Warren hit back-to-back buckets within 15 seconds to stretch the lead to double digits. 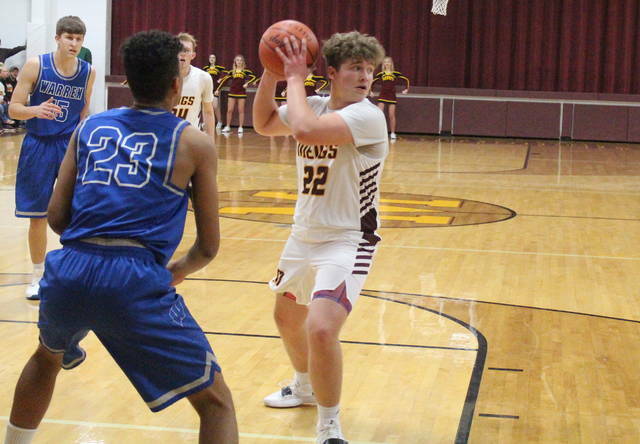 The Warriors went on to sink 11-of-21 free throws in the final six minutes — in which the Marauders had four players foul out — and WHS sealed the 63-48 victory. Following the first setback of the season, first-year MHS head coach Jeremy Hill admitted his team didn’t do what it took to win the game. In the setback, the Marauders shot 15-of-42 (35.7 percent) from the field, including 4-of-15 (26.7 percent) from beyond the arc. Meanwhile, Warren was 18-of-46 (39.1 percent) from the field, including 4-of-13 (30.8 percent) from three-point range. The teams combined to shoot 70 free throws, with the guests going 23-of-45 (51.1 percent) from the line, and Meigs shooting 14-of-25 (56 percent) from the stripe. The Warriors claimed a narrow 30-to-29 rebounding advantage, despite Meigs’ 14-to-11 edge on the offensive glass. Collectively, the Marauders had a dozen assists, five steals, one blocked shot and 19 turnovers. WHS finished with team totals of 11 assists, 12 steals, one rejection and 13 turnovers. 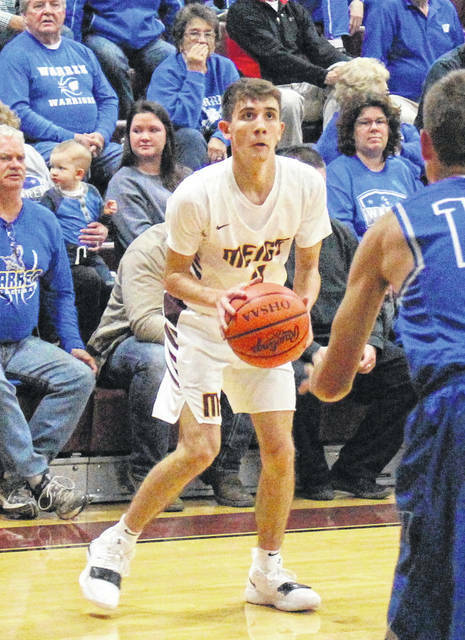 Weston Baer led the Marauder offense with 13 points, featuring two three-pointers, a trio of two-pointers and a free throw. Next was Zach Bartrum with 11 points, to go with six rebounds and a trio of assists. Nick Lilly recorded seven points in the setback, while Cooper Darst and Coulter Cleland had five points apiece, with Darst earning a team-best five assists, and Cleland pulling in a team-high seven rebounds. Cole Betzing and Wyatt Hoover had three points apiece for the hosts, while Bobby Musser chipped in with one. Zach Bartrum led the MHS defense with three steals and a block. Austin Barta and Brandon Simoniette led the Warren offense with 13 points apiece, followed by Seth Dennis with 10 points and three assists. Makiah Merritt scored nine points, Clay Miller added five, with both players grabbing seven rebounds. Kurt Taylor, Joel Chevalier and Gabe Venham each scored three points for the victors, while Bryce Knost and Isaac Colegrove added two apiece. Dennis, Merritt, and Simoniette had two steals each for the WHS defense, while Colegrove rejected a shot. Hill noted that the Maroon and Gold won’t dwell on the setback, but will try to learn from it as they move forward into league play. 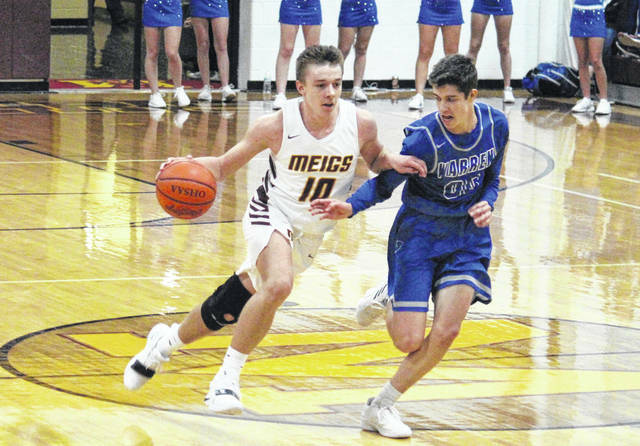 Meigs opens it’s Tri-Valley Conference Ohio Division campaign at home against Wellston on Friday. The Golden Rockets and Marauders were fourth and fifth respectively in the league last season.